PC enclosure for computer protection against dust, dirt, liquids, theft and vandalism. This page should answer some of the questions that we are most commonly asked. If there are any questions that are not answered here please feel free to contact us and we will get back to you with a reply as soon as possible. Question: So why choose PC-Guard? Answer: Protect your investment PC-Guard enclosures will ensure that desktop PC's in hostile environments are safe and will continue to operate properly. This protects your investment in the PC and protects against lost production time. PC enclosures ensure you achieve maximum utilisation of your total production unit. Question: Why shouldn't I make my own enclosures? Answer: Because you get a better and cheaper solution when you buy a PC Guard enclosure. At PG Guard we specialise in the design and manufacture of PC enclosures so we design out cost and drive down manufacturing overheads. Also if you try to build your own enclosure once you cost in your time to design develop and then manufacture or have manufactured, it will actually cost you more, because it takes your time away from your core business which your good at. You don't build your own desks do you? Question: Why bother with a PC enclosure? We can replace the PC if it gets damaged. Answer: Of course you could, but what about loss of data, the time for an engineer to fix it, and the loss of production. The task of a PC Enclosure is to protect the function of the PC and the data it holds. Question: Industrial PCs and PCs in a PC Enclosure, what is the difference? Answer: In general there is no vast difference in the electronics, it is the packaging that make it industrial. A PC Enclosure is the packaging and when supplied separately allows you to install or upgrade your own PCs. Question: Will the Computer warranty be affected by a PC Enclosure? Answer: No, but an unshielded computer in an inappropriate environment may not be covered! Answer: Maintenance on a bespoke industrial PC may be difficult to obtain .In many cases only the supplier can provide the support. Any computer maintenance company will be able to give you cover of a standard PC in a PC Enclosure. Question: Concerned about the security of your PCs? Answer: Complete encasement of a PC is a most effective method to help prevent and deter theft. Question: What is involved with installation? Answer: Very little! 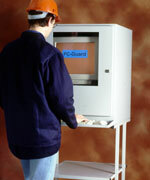 PC-Guard includes fans, filters and mains wiring and arrives ready to use. A PC can be fitted in minutes without modification or additional parts. Question: Why should I protect my PCs - they are inexpensive to replace? Answer: The issue here is not the cost of the PC but the cost of production downtime. How would you cope with a 24 hour production stoppage - because that is how long it could take to repair or replace a PC. Exposure to environmental hazards can cause PCs to fail without notice. Question: Why shouldn't I use industrial computers? Answer: Many companies prefer desktop PCs to industrial computers because they cost less, are more flexible, easier to purchase and maintain, and because it simplifies corporate IT strategy. The main obstacle, however, is the protection of the PC in hostile environments. Airborne particles, fluids, extremes of temperature and vibration are hazards that the office PC is not designed to tolerate. Additionally the risk of tampering, physical damage and theft can be even greater on factory floors. Computer downtime on a production line can mean a reduction in plant efficiency at least, a loss of business at worst. Placed inside a Enclosure, however, a PC will receive the same level of protection, or greater, than an industrial computer. And when your PC has outlived its use, simply buy a new one and put it inside the same enclosure.